Inquests into the 96 football fans who died in the 1989 Hillsborough disaster have concluded they were unlawfully killed. The jury found match commander - former Ch Supt David Duckenfield - "responsible for manslaughter by gross negligence" due to a breach of his duty of care. When Mr Duckenfield, the police officer in charge of keeping people safe at Hillsborough in 1989, attempted to apologise for the deaths of 96 people, the family members listening to his testimony gasped. During days of intense questioning at the inquests in March 2015, he admitted that he had lied about mistakes he made on the day and had kept that lie going for 26 years and through several legal inquiries. Now the Crown Prosecution Service could consider a prosecution against the former chief superintendent from South Yorkshire police after a jury decided his actions amounted to "manslaughter by gross negligence" due to a breach of his duty of care to fans. Mr Duckenfield, now 71, had claimed that after a large crowd built up outside the turnstiles at the Leppings Lane end of the stadium, Liverpool fans had broken in, causing a rush of people to flood into the fenced-in terraces. But he now admits the crush occurred after he ordered an exit gate to be opened allowing 2,000 Liverpool fans to enter the stadium in just five minutes. Mr Duckenfield said that, in the pressure of the day, he froze and did not consider the consequences of his actions. The former chief superintendent said he "deeply regretted" not telling then-FA chief executive Graham Kelly that it was his decision that caused the fatal crush saying he would regret the lie "to his dying day". The former police chief was barely seen or heard of in the immediate aftermath of the disaster. The inquest heard Mr Duckenfield testify he was struggling to sleep in the run-up to the 1989 Taylor Inquiry, and claimed to be drinking "half tumblers of whisky" to "find the courage" to read statements. By November 1991, he was medically retired from South Yorkshire Police on a full pension, two years after being suspended from duty. A police doctor certified him as "unfit to undertake the duties of a police constable" and diagnosed him with "severe depression and post-traumatic stress disorder". 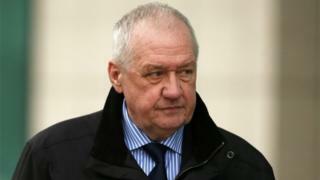 Mr Duckenfield said he felt the diagnosis was a "sign of weakness" and tried to "conceal" his conditions from family and colleagues but the publication of the report by the Hillsborough Independent Panel in 2012 and a TV programme he had seen about the disaster's effect on the families prompted him to finally tell the truth. He said footage of a mother having to cuddle her dead child on the dirty floor of the Hillsborough gymnasium was the most moving thing he had ever seen, and that it had shown him "what it means to a mother to lose a loved one". "I hid myself away and could not bear the word Hillsborough", he said. " I hoped it would go away. But then two years ago I had to force myself to look at matters and, as a result, I could only do so with the assistance of doctors. "Over this period, I have had to come to terms with reality, and that is why, over the period, you might say I dug my head in the sand, didn't admit things to myself, but I am now very much older, very much wiser, and very much more understanding of the events of the day and have decided to tell the whole truth." To the families he added: "It has now dawned on me what it means to you, and I am dreadfully sorry." "I have no excuses. I apologise unreservedly to the families and I hope they believe it is a very, very sincere apology." Video What happened at Hillsborough?